“So, if morale suddenly improved as the speed of the line improved, what changed? What changed inside your team?” I asked. “So, what changed inside their heads?” I asked again. “They are on their way to mastery,” I said. That word mastery hung out there like a full moon. Inescapable. “Competence and mastery,” she said. “Why do people perform at a high level?” I asked. “Because they can,” she replied. “Give them the tools to become competent and you will see progress.” Emily smiled. It was beginning to sink in. “At least, that is half the story,” I announced. 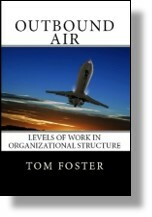 This entry was posted in Competence and tagged competence, mastery, productivity on November 13, 2017 by Tom Foster.